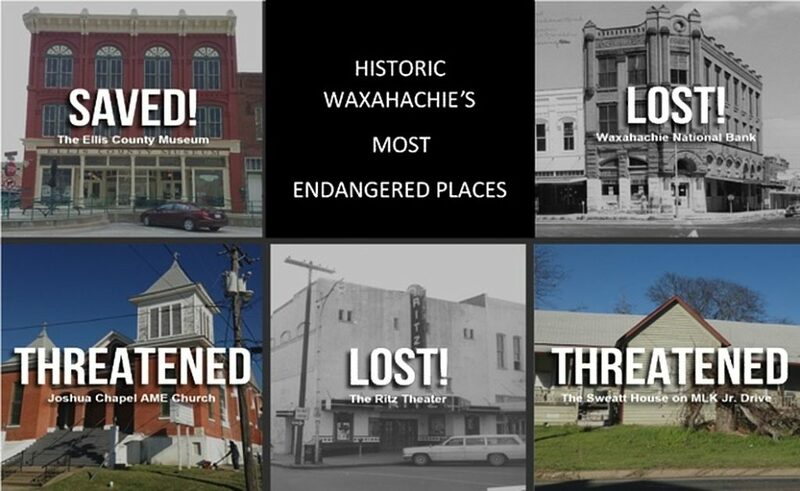 Why a List of Waxahachie’s Most Endangered Places? Waxahachie is one of the most historic towns in Texas, but our heritage is fragile. Each year, many historic places disintegrate, are torn down, or are “remodeled,” and stripped of their historic features and significance. The reasons for the loss of historic places include neglect, encroaching development, or lack or resources, such as time, money and the skills needed to maintain a historic place. Often, a place vanishes without our ever knowing the stories connected to the place that tell an important part of Waxahachie history. And once these places are gone, they’re gone. By creating a list of endangered places in Waxahachie, we highlight a few of the many historic places threatened. We hope that by spotlighting these endangered places, we will increase our community’s understanding of the value of our historic places and encourage people to preserve the places and their stories. Submit Your 2019 Nomination Now! The announcement of the 2019 list will be made May 9, 2019 at a reception held at the Ellis County African American Hall of Fame. More details coming soon. Held on May 10, 2018 at the Joshua Chapel A.M.E. Church in Waxahachie. Church history provided by Mr. Bertram Maxwell, church Trustee Emeritus.